Dario Mollo is without a doubt one of the most talented players/songwriters in the current hard rock scene and takes pride in the complete process of writing and recording music. He worked with such artists as Glenn Hughes, Tony Martin and Don Airey and produced such bands as Anathema, Lacuna Coil and many more. He started his musical career in 1981 with a band called Crossbones. The band appeared during the early 80’s in several festivals and compilations dedicated to young Italian heavy metal bands. In 1986, Dario met producer Kit Woolven (Thin Lizzy, Cradle of Filth and UFO) and recorded a song for a compilation called "Italian Rock Invasion". This was the beginning of a friendship that has lasted ever since. Dario later on also had the chance to work with current Deep Purple keyboardist Don Airey (also Rainbow and Ozzy Osbourne) and they toured together with Crossbones across Europe. After the Crossbones project was set aside, Dario devoted his time to the improvement of his technique and style and he built his own recording studio that is now used by many other bands. During this time, Dario began to write a new set of songs and a new unnamed project began to emerge. Drawing on his previous years of work, his many valuable hours of studio time and his improved technique, he teamed up again with Don Airey and some friends to record the album now known as The Cage featuring former Black Sabbath shouter, Tony Martin on lead vocals. "The Cage" debut album was very successful with both critics and fans, marking the real start of Mollo’s reputation in the international rock scene. In the meantime Dario started to work on another -yet very ambitious- project , with a different line-up, that saw the legendary “Voice of Rock” Glenn Hughes (ex Deep Purple) on vocals, Roberto Gualdi on drums, Max Matis on bass and Dario Patti on keyboards. Dario was soon contacted by Frontiers Records that offered him a contract for the worldwide release of the new project, called Voodoo Hill. 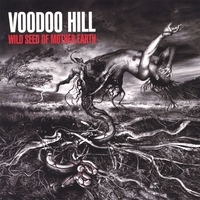 As for The Cage, Voodoo Hill album had a great success, iwith such press comments as "Best Hard Rock Album Of The Year". After a successful second The Cage album (which also featured the amazing former Blue Murder bass player Tony Franklyn), Dario immediately committed to the songwriting and production of a second Voodoo Hill album. Dario worked hard during the entire 2003 in order to ensure the best results and to offer a real and timeless masterpiece to his already numerous fans. The final result “Wild Seed of Mother Earth” is possibly the heaviest release on which Glenn Hughes has ever sung! But definitely the songwriting and the production shine like never before ! The line-up featured on the cd includes also: Roberto Gualdi on drums, Dario Patti on keyboards and Fulvio Gaslini on bass.